UC’s engineers and computer scientists are helping Ohio’s Department of Transportation launch its first fleet of drones to improve traffic safety and keep commuters on the go. Engineers at the University of Cincinnati are taking to the sky to improve traffic safety in one of the busiest driving states in America. Gridlock is both a nuisance and a safety issue in Ohio, where a network of interstate highways connects six Midwestern states. Drivers in November last year logged 9.7 billion miles on Ohio roads, fifth most in the nation, according to the Federal Highway Administration. UC’s College of Engineering and Applied Science assembled a team of experts in computer science and electrical, mechanical and aerospace engineering to help Ohio’s Department of Transportation (ODOT) to use drones to assist core business functions such as monitoring traffic, inspecting bridges and improving safety for drivers. The university is equipping the state with a fleet of drones that can send live images and traffic data to transportation officials as part of a four-year, $2 million contract. The drones capture and transmit video and traffic data to UC computers using algorithms to count and sort traffic into 14 categories, from motorcycles to the heaviest big rigs. The drones supplement data the agency collects using manned aircraft. But since drones can be launched easily, quickly and at low cost, they have many potential uses, Judson said. 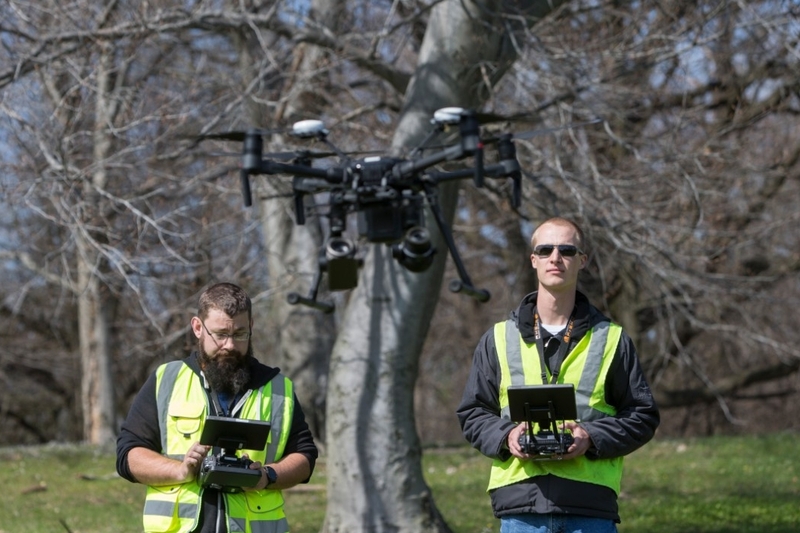 UC research associate Bryan Brown, left, and UC engineering student Austin Wessels operate a drone the university is using to capture traffic data and images for the Ohio Department of Transportation. 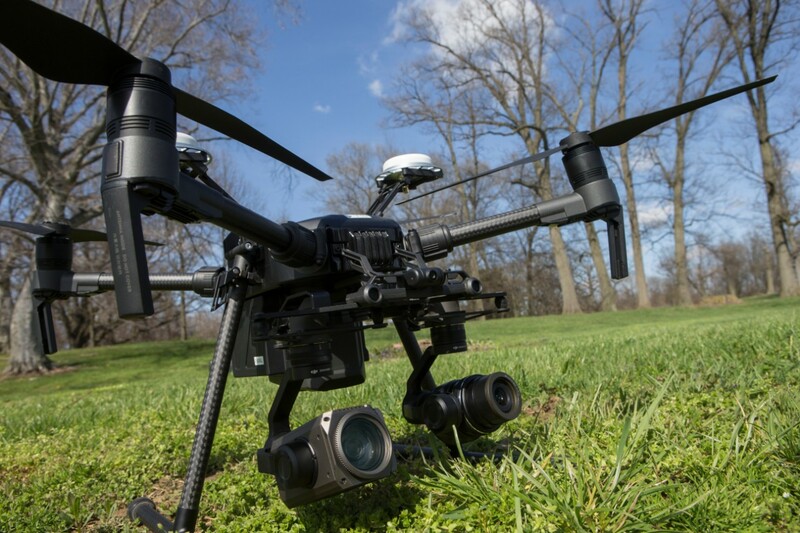 UC is providing four certified pilots, acquiring permits from the Federal Aviation Administration and building a digital platform to analyze the data in the state project, associate professor Manish Kumar said. Kumar is one of five principal investigators assigned to the project along with his research partner, Kelly Cohen, director of UC’s Department of Aerospace Engineering. Cohen and Kumar in the past decade have collaborated on more than 50 research papers, many of them on artificial intelligence and drones. They oversee UC’s Unmanned Aerial Vehicles Master Lab. UC also is helping the state develop operating procedures and best practices for flying drones safely and effectively, Kumar said. “UAVs can help in monitoring traffic to improve plans for detours or in cases of congestion. You’re able to see what the current traffic flow is. You have more resources at your disposal,” Kumar said. UC uses the latest commercially available drones, which are specially equipped with communications gear to meet the state’s needs. UC has been flying drones for the state for the past year whenever weather permits. “In the future we want to be weatherproof but for now we’re careful. We fly only on dry, still days,” Kumar said. UC's drone project demonstrates how this urban public university is leading students into a new era of innovation and social impact. Next lives here. UC built on its existing relationship with the state for the latest project. UC professor Arthur Helmicki, another principal investigator on the project, previously flew drones to record and analyze the state’s implosion of the Jeremiah Morrow Bridge off I-71. “This is a very hands-on project,” Helmicki said. “The vast majority of our time is spent in the field deploying drones at various locations, running flight operations and flight tests and coming back to improve the process. “You have computer engineers working with mechanical engineers working with aerospace engineers working with transportation engineers. Bringing together all these disciplines allows us to tackle this problem in a way that matches the many facets associated with the research,” Helmicki said. 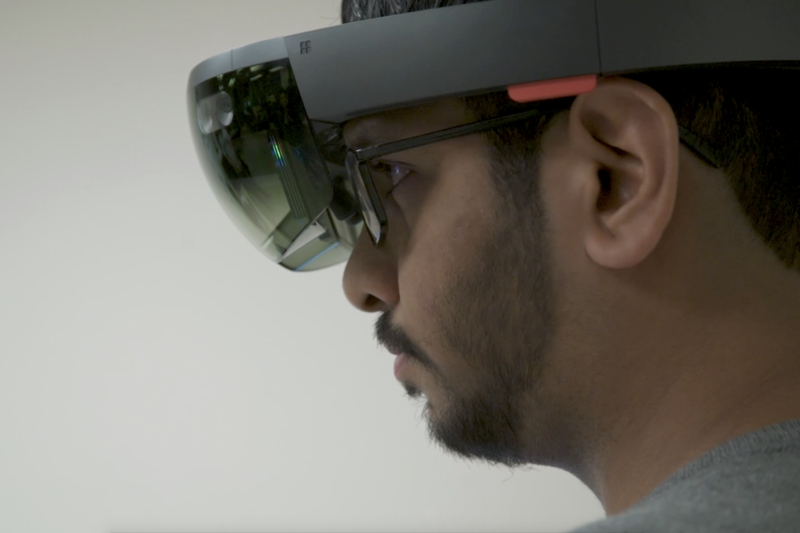 Augmented reality places virtual reality in the confines of a real setting like an engineering lab or conference room. UC’s drones can collect terabytes of information. But to understand the big picture, sometimes you have to see one. That’s where the state project gets really interesting. 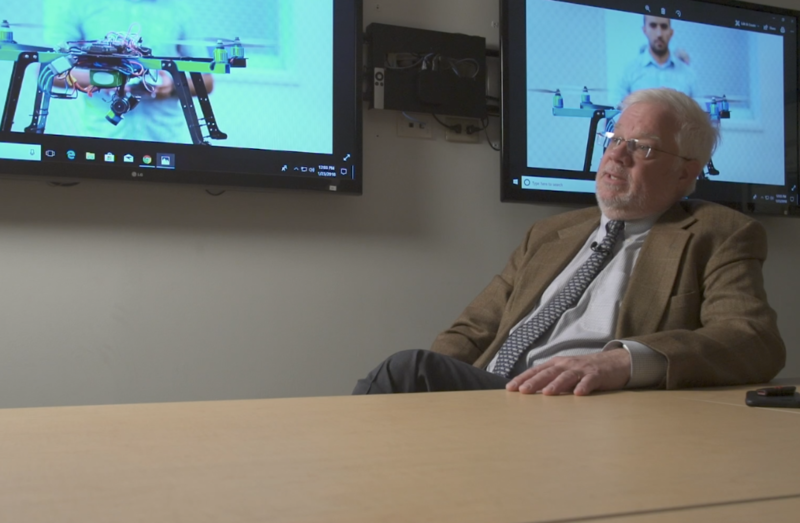 In Helmicki’s computer science lab at UC, students are working on an augmented-reality system that stitches together photos shot by drones into a three-dimensional rendering. Unlike virtual reality, which puts the user in a virtual three-dimensional space, augmented reality creates a virtual world around the user in an actual three-dimensional space, like a conference room. 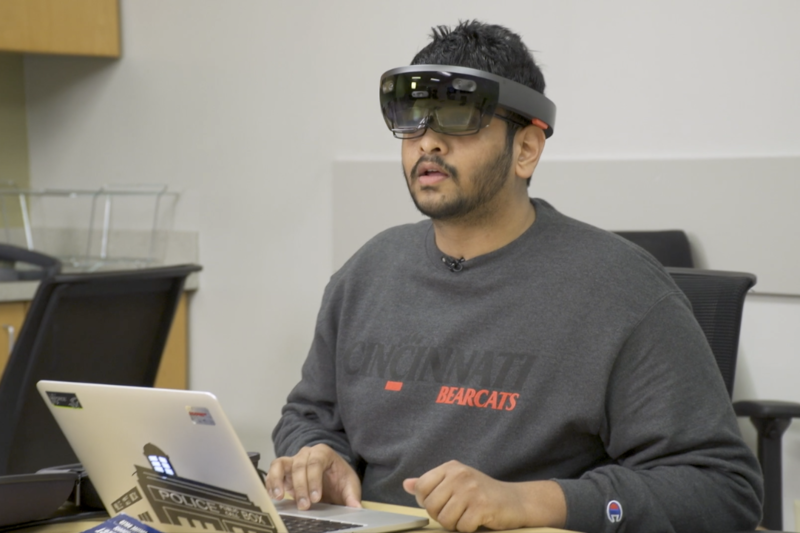 UC graduate research assistant Arjun Chiddarwar donned a Microsoft HoloLens headset and craned his head around the room for a demonstration. He pinched the air in front of him with his index finger and thumb and the headset sensors shot a spiderweb of triangles across the space to measure the room’s every surface: the floor, walls, ceiling and furniture — even the people. With another magician-like pinch, his 3D project suddenly materialized in front of him in vivid color and crisp detail between the desk, door and lab bench. UC's drones have multiple cameras to capture images or video for remote viewing, data collection and analysis. 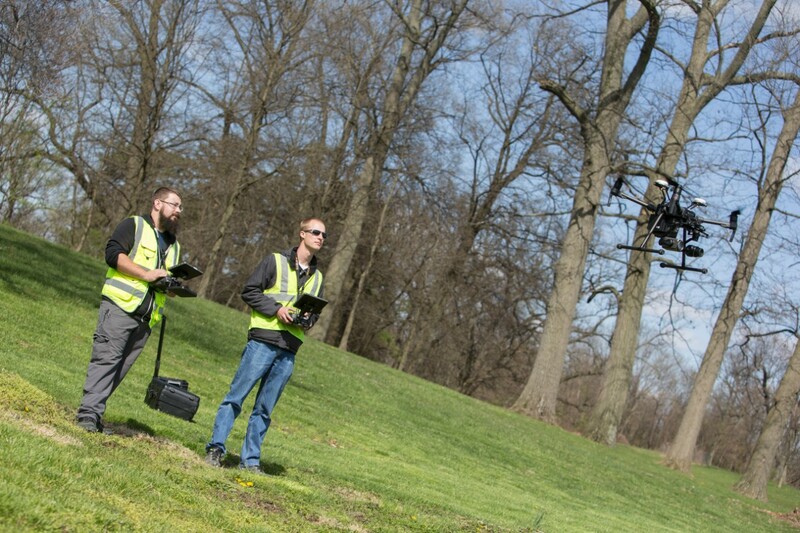 For the demonstration, the 3D project was the green campus of the Muscatatuck Urban Training Center two hours west of Cincinnati in Butlerville, Indiana, where Chiddarwar and his research team recently shot drone footage for a presentation to transportation officials attending a conference there. The 6-foot-long map hovering four feet above the floor displayed the campus green with its mushroom-shaped perimeter road and dozens of buildings that through the visor headset looked real enough to touch when you leaned in to take a closer look. Unlike a satellite view from Google Earth, the perspective of each static building changes as you walk around the map, just as if you are in a drone circling around the campus. “The best part is the 3D model stays intact. You can walk around it and see it from many different angles and a whole new perspective,” Chiddarwar said. He craned over the empty space to examine minute details only he and his UC classmate could see through the headsets. Chiddarwar used another hand gesture to drop a pin next to a building, where he can leave notes on the model for other collaborators. When a second person dons a headset, they suddenly become visible to other users through a virtual avatar. This allows for seamless collaboration, he said. So far, the state is encouraged by the results, Judson said. “We are breaking new ground. It’s a huge help, having these guys not only in aeronautics behind it but also with electrical and civil engineering to help us out, too,” he said. The state recently granted UC an $800,000 two-year extension to expand the project. UC will help the state implement drones in inspections of bridges and other infrastructure. UC is helping the state develop a simple system to stitch together high-resolution photos from drones into a 3D model in a process called photogrammetry. This would allow ODOT inspectors to upload pictures and create models with a few computer keystrokes. Federal law requires states to inspect all bridges every two years. Ohio inspects more than 43,000 bridges annually. But even a routine inspection can be arduous. Typically, the state uses one of two “snooper trucks” that have articulating buckets to lower inspectors under a bridge. But for some bridges, inspectors have to don rock-climbing gear, Helmicki said. Inspectors could examine the bridge in similar detail as they would in person without having to shut down lanes or impede traffic. Employing drones to capture detailed images of high, tall bridges would allow for efficient inspections. “The state could augment them with a fleet of drones to fly around a structure and take detailed images in places where it would be hard for a human to go,” Helmicki said. Cohen said the partnership demonstrates how UC can harness its collective resources to tackle big problems. UC research associate Bryan Brown, left, and UC engineering student Austin Wessels work together to operate a drone. One navigates the drone in space while the other manipulates its cameras. Do you have good research ideas? At UC, students can collaborate with colleges across campus to turn their ideas into real-world solutions. Check out the College of Engineering and Applied Science or explore other programs on the undergraduate or graduate level.